Sitting right opposite to the Ionian Sea, the recently renovated Marbella Corfu Hotel offers a wide range of amenities & facilities as well as comfortable accommodation. The rooms in the hotel are available in plenty of categories and offer spectacular views of the sun, sand, sea and gardens. Foodies will also have a nice time in the hotel, as there are several dining options within and around the hotel. The hotel’s spa offers exceptional massages as well as beauty treatments. Children too can have a lot of fun, as the hotel comprises a children’s water park and baby pool. Other than this, they can enjoy delicious kid’s meals and have fun in the kid’s club. 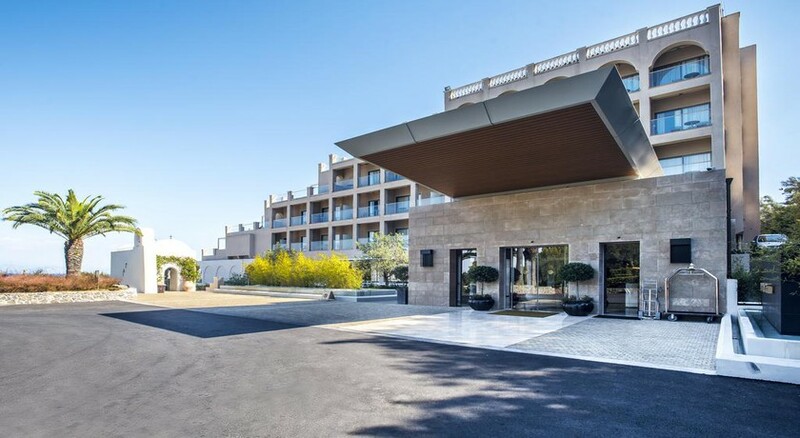 The hotel’s marvellous location and full range of facilities make this hotel one of the best places to stay when you are on a Greece Holiday. Marbella Corfu Hotel is strategically situated in Corfu, Greece. There are numerous bars, restaurants, sport clubs and cinema theatres, making the stay exciting for guests. The Corfu International Airport is 15.4km from the hotel. The rooms in the hotel are available in plenty of categories to suit the needs of the modern day traveller. The room types include double rooms, family rooms and Marbella suites. Some of the facilities in the rooms include two standard beds, desk and mirror, wardrobe, safety deposit box, mini bar, Wi-Fi, flat screen TV, marble bathroom and a private balcony-terrace. There is a wealth of dining and drinking options at the Marbella Corfu hotel. The bars and restaurants in the hotel include La Terraza Retaurant, Comodo Italian Restaurant, Dolphin Restaurant and Bar, Platea Greek Restaurant, La Bussola Restaurant, Belvedere Bar, Eleonas Bar, Cascade Pool Bar, Splash American Diner and M Bar. The hotel offers plentiful sport, fitness and leisure facilities to keep guests engaged on their holiday. Take a dip into the outdoor swimming pool and relax on one of the sun loungers spread across the pool. Those who are enthusiastic about fitness will have a nice time in the hotel, as there is a fully-fledged fitness centre with expert trainers. If you want to lounge and/or pamper yourself, head over to the hotel’s spa that offers multiple massages and beauty treatments. Quite simply perfection... everything was just superb , the staff are fantasyland the hotel is stunning!